” Raymond is director of the Satellite Sentinel Project (SSP), which aims to use advanced satellite imagery to monitor potential human rights abuses inSudan. And it was all Clooney’s idea, turning him from just another Hollywood liberal with a pet cause to a genuine expert and campaigner on Sudan. 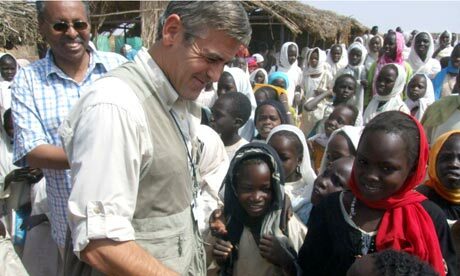 Together with John Prendergast, another campaigner, Clooney has sneaked repeatedly into the country to document the random bombing of civilians and other atrocities. …But it is in the day-to-day work of the Satellite Sentinel Project that Clooney’s impact is really being felt. He came up with the idea, and spoke to Google and the satellite company DigitalGlobe to help set it up, and he donates hefty speaking fees to keep it funded. It has been up and running now for 15 months. …Based in a nondescript suite of offices near Harvard Square in the Boston suburb of Cambridge, Raymond heads a small team of staff and student volunteers who monitor events on the ground in the heart of what is practically a war zone. Every day Raymond and his staff meet in what is dubbed the “situation room” and news and reports from Sudan are analysed. They also pore over satellite pictures and compare them with a database of previous shots, looking for changes such as new military roads or camps, or troops on the move. One day last week, SSP staffer Brittany Card was analysing news stories from Sudan describing a governor visiting two camps that were listed as mobilisation points for the People’s Defence Force, a militia group widely used in repressive actions by the government. SSP imaging expert Isaac Baker traced out two rectangles to cover each camp. “We don’t have a recent collect on that,” observed Raymond. Baker began to tap out a request for fresh satellite imagery as Raymond and Card discussed which camp to monitor if only one picture could be taken. “The one on the east,” she said eventually. By using such advanced satellite imagery and being able to commission and take photographs within hours of receiving reports from the ground, SSP can genuinely plot and analyse the course of the conflict. “We don’t move the pieces on the chess board. But we have to figure out what they mean,” said Raymond. SSP’s work was initially conceived as mostly gathering evidence that might be used in any future war crimes tribunal for Sudanese leaders. But the imagery was so accurate that it could also be used to monitor claims about massacres and mass graves. After someone on the ground described watching bodies being buried in a mango grove in the town of Kadugli, SSP was able to document the site from the air. It also uncovered what appeared to be body bags lying in freshly dug pits elsewhere in the town. It has also shown troops surrounding towns and burned villages. In one astonishing set of images, it even captured an Antonov transport plane – from which Sudanese forces regularly roll out bombs – caught in mid-flight with plumes of smoke rising where the explosives had been dumped on civilian targets. In September last year, the group’s analysis revealed what appeared to be an imminent attack on the town of Kurmuk in the Blue Nile province. Photographs revealed at least 3,000 troops equipped with tanks, artillery and attack helicopters. That prompted SSP to issue a warning, giving an opportunity for many to flee. For Raymond and his team, it was a turning point: they were no longer just observers, but were able to have an impact. For a humanitarian group operating thousands of miles away from the crisis, this was new territory. “No one is doing what we are doing right now. It is a splitting the atom moment for the human rights community,” said Raymond. However, the experience of Kurmuk – which did later fall to the army – also came with a sense of danger and great responsibility. “What if we get the direction the force is going wrong? You could have walked the civilian population right into them,” he said. There is already talk of the group’s methods being applied to Syria, or to other nations caught in the turmoil unleashed by the Arab spring. It has overturned the idea of what investigating human rights abuses means.